HomeAccessoriesMe-Foto Tripod Review and Give-Away! 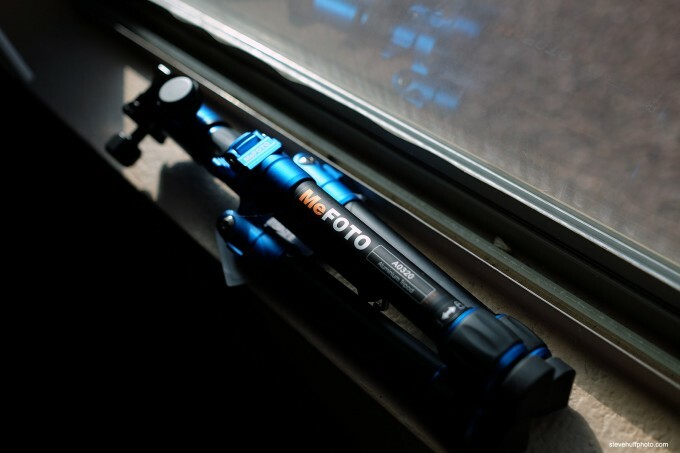 Me-Foto Tripod Review and Give-Away! Max HeMe-Foto Tripod Review and Give-Away! At the end of this review there is a link where I am giving away a free MeFoto tripod on Facebook! 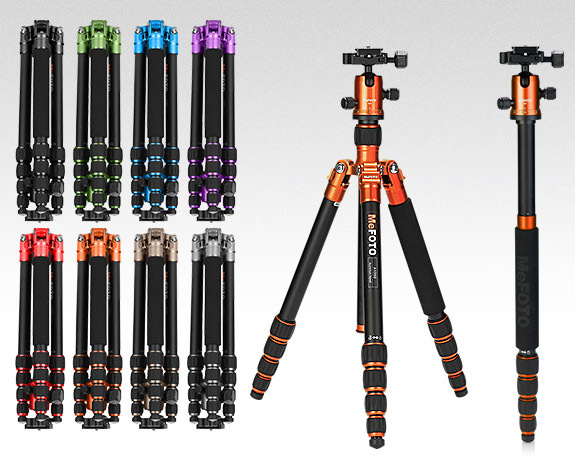 Be sure to enter to win the exact tripod you see below! I admit..I am not a huge fan of tripods for my photography. I rarely ever use them (for photos) and in the past 10 years I probably used a tripod a handful of times and that was mainly due to HAVING to use them at specific events or for camera tests. Nope, just give me a nice light camera, a lens and some memory or film and I am off and running – nice and light. But even though I do not use them often I do indeed own a tripod and have had the same one for 15 years! 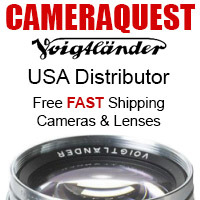 I use it mainly for video and it has come in handy for that when I needed to stabilize my camcorder. There are times when long exposures also get me to pull out the trusty tripod as it is the only way to do such photography and get good results. Long story short, my tripod experience is limited as I just do not like to lug them and use them. I am not a landscape guy nor a long exposure guy so keep that in mind when reading this. All in all, this will be my quick thoughts on using the MeFoto tripods but remember, I have limited experience with other brands of tripod. A few months ago I ran into a rep from MeFoto and he offered to send me a couple of tripods for review. I was hesitant (because I never use them) but when I saw the tripod he had in his camera bag (yes, in his camera bag) I immediately had to know more about these small and tiny wonders. As I looked at the smallest model called “The Day Trip” I instantly wanted one. Why? I am not sure but I instantly fell for the design, colors and teeny size/ease of use. Maybe the reason I never use tripods is because I did not want to lug around my beast. Hmmmm. After a demo and a few words he promised to send a couple my way and that he did. The small and tiny “DayTrip” will hold up to 8.8lbs and can be used almost anywhere. At $119 it is a great buy in the small tripod world and is super cool at the same time. Ball head, smooth controls and a well made feeling makes these tripods a contender for those looking for small, light and quality. Over the past couple of months I have been in possession of three tripods from Me Foto. The Daytrip, the Backpacker and the Road Trip. All three are very nice, very well made and VERY affordable. No, these are not $1500 rock solid big and heavy tripods. Instead they are small genius designs that are light, easy to carry and they simply just work. The little DayTrip tripod is TINY and will fit inside most camera bags. It is not a full size tripod but will do for those times when you just needs something to hold your camera. 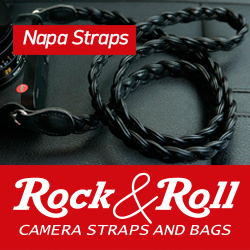 The Road Trip is full size and will even quickly convert to a monopod, which I find extremely useful and cool. At $189 it is a full featured tripod that would be all many of us need. I really love this model and in Titanium it very nice to look at as well. They are sleek, cool, fun, small, light and functional. My only gripe is that you need an allen wrench to loosen and tighten the mounting plate to your camera. The tripods come with the tool but I lost two of them already and on one occasion could not get the plate off of my camera because I did not have the wrench. Throwing on a hand tightening mechanism would be much better IMO. They do come with a carrying case to hold the tool but I always find a way to lose small little items and I never did use the carrying case as the tripod resided in my bag most of the time. From tripod to monobod in seconds.. Besides that little niggle I love these things and not only are they great buys and a bargain for someone seeking a light and very portable tripod, one of these now resides in my own stable 🙂 Good stuff and highly recommended! Features and operation Breakdown: It is a tripod. You open the legs, attach your camera, set it up where you want it and shoot 🙂 They are lightweight, have a built in bubble level, have an included very nice carrying case, 360 degree panning capability, two leg angle positions, a hook for adding more weight to the center for stability (or to hang your bag), easy twist leg locks. Great bang for the buck. You can see feature details HERE. In use they are light and easy to carry (as mentioned) and even has a very nice carrying case that comes along with each and every tripod. I had no issues bringing any of these along with me. My son Brandon is using one for long exposures and even for his binoculars for night sky viewing. He really loved his time with the MeFoto as well. All in all, a wonderful product that is very functional. If it had a finger screw base plate for attaching the camera it would be perfect! So there you go..my quick look. There really is nothing to dislike about these. Where to Buy MeFoto and how to WIN one! WIN A FREE DAYTRIP Tripod! Win a free DayTrip Tripod courtesy of MeFoto and SteveHuffPhoto! Click HERE to enter on Facebook! And the winner is….Jeremy Simmons! I just bought a RoadTrip tripod and now I have a question about stability. Will the tripod tip if the lens is extended to its max length in either landscape or portrait mode? How about adding the SB600 flash, especially when placed in the portrait mode? Will the ball head slip with the above configuration – lens extended and adding flash unit? Damn, I don’t do Facebook so I can’t win but I already own the Road Trip version and the Day Trip is in the mail from Amazon.com. I love their size, weight and carrying capacity. 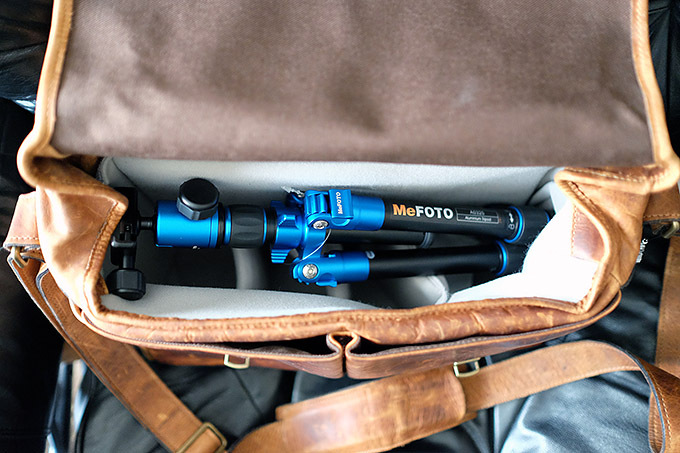 They say the best tripod is the one you carry with you and MeFoto’s unique design has me leaving my Manfrottos at home. 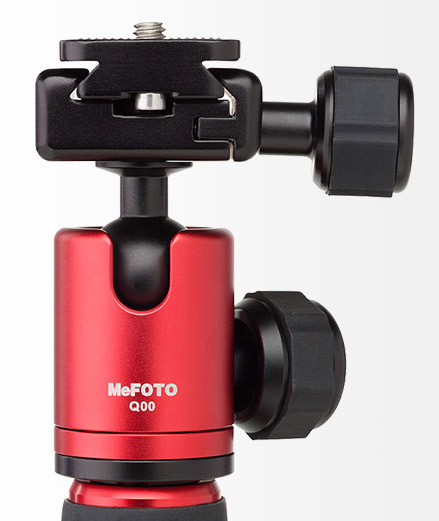 Hi Steve, I just bought a MeFoto BackPacker (in the Netherlands) and guess what… it comes with a two ways possibility to tighten the mounting plate. It’s now possible to use an allen wrench AND/OR a coin! Furthermore, as you already stated in your review, it works amazingly well, it’s pretty stable, easy to use and indeed very affordable. And what to say about the colors? Great tripod for my Leica’s. Steve, I don’t know how much room there is under the plate but a number companies offer a screw with a coin grove in it for tightening. . . I tried the finger ones ans they can loosen. The ones that you can tighten with a coin don’t. . . . Thanks for the info. EVen so, I prefer a finger tighten latch. The one I have used for years (when I do use it) has never even hinted at coming loose. Ever. It’s quick easy on and quick easy off. No tool to lose, no coin to find. When I “upgraded” my camera system to an Olympus E-M5 from a Canon APS-C, I sold my old, big tripods and bought a RoadTrip. It’s a great size, and quite sturdy for such a compact tripod. After using tripods with flip lock legs for a long time, I was happily surprised to find that the twist locks on the MeFoto legs make it even faster to deploy and just as fast to pack up. I just grab as many locks as I need for extension with my hand, twist all unlocked with one movement, and let the legs fall to the desired length. So fast. Being able to flip the legs up make the folded tripod very compact. You’re right, I think the RoadTrip hits a sweet spot for size, extension, and portability. And, the bullhead is pretty sturdy and easy to use. The mounting plates are Arca compatible so extra plates are easy to find. The RoadTrip uses 50mm plates. BTW, you can get a tripod screw with a finger handle to replace the original screw to make mounting the plate faster. I have been using two XE-2’s for the last 4 paid weddings that I shot with the 23/14/35 and 60. And besides the 60 being slow and hard to use I had not issues of any kind with focussing with any of the other lenses. Worked like a dream and is currently paying for my bills. You clearly have something against fuji camera’s, why even bother to mention them on your site? I mean common missing focus on a tripod, are you kidding me…. perhaps with the first firmware of the x-pro 1 I would have believed that….. Just pass on all of the fuji releases, nobody will think any lesser of you, they clearly are not your ‘thing’ ;). “Clearly”?? Did you just blow in here yesterday after a bad day in the office? Steve has shown nothing but admiration for Fuji cameras on this site. So he had trouble with focus when assembling this particular article – surely he can mention that without you getting your knickers into some kind of Gordian Knot over it. Thanks for the awesome review arraigning giveaway of this great product. The review answered my questions, I’d like a small tripod that’s easy to set up that I can have on hand. I have a 25 year old SLIK that is fantastic, but it is too bulky for taking on a hike. If what Chester Arthur says above is true then you may want to look at one of the other brands (all being the same hardware), my Sirui tripod looks identical to the one above and was on sale for $79 so a considerable savings. I can vouch for the quality and functionality. Does it come with a hook to hang your camera bag from? You can drape your camera bag over the tripod for extra stability if under high wind or if the legs seem unstable. Yes, I mention this under the features breakdown. You can add more weight for stability under the tripod using the hook. This is more like an advertisement than a review. Was not worth the read. Sorry. Well, that is probably because I review what I use. I never use tripods but did use these on a few occasions. I have experience with ONE tripod over the past 15 years. In comparison, these are much lighter, smaller and convenient. They do the same job just as well. Sorry if you found it not to your liking but everything on this site is free to read or free not to read. You can choose what you want to look at and vice versa. But it was not an advertisement as MeFoto is not an advertiser. I told them I would check out the tripods and I did. Everything you need to know about them is at their website and right here. No hard feelings 🙂 i am very much looking forward for your next reviews, especially about how the fuji will perform against the very good Sony. Have fun in Vegas. Where’s the review? No discussion of features, construction, materials, operation…. Features and operation: It is a tripod. You open the legs, attach your camera, set it up where you want it and shoot. They are lightweight, have a built in bubble level, have an included carrying case, 360 degree panning, two leg angle positions, a hook for adding more weight, twist leg locks. Great bang for the buck. You can see all of this info at their website. As for using it, worked for me just as any tripod does though I am not a fan of the allen key baseplate (as I mentioned). I’ve looked at these in the past as I thought I should update my near ancient Manfrotto tripod. I too don’t normally ever use a tripod but I’ve recently been more involved with landscape and low light work. We have a lot of waterfalls in my area and you just have to have a tripod to do them justice. I know Steve you mentioned having a little issue getting the bracket off the camera. One of the things I did to improve my Manfrotto was I purchased Really Right Stuff L-Plate for my RRS Leica Grip kit. I like you Steve go light and without a tripod 95% of the time. However, I recently met with a landscape photographer for Olympus Australia and I asked what was one key element of gear required for success and the reply was a tripod. I thought a camera but go figure. A tripod is on my list and this look like a little gem. These are similar in style and construction to my recent Fotopro C5i purchase. Good for the price and the ability to make a monopod is useful. Pretty funny as I was just visiting my local photo supply store today and I saw this tripod in person! It was the orange one and a very good looking tripod as it caught my eye. I wasn’t looking for one but I played around with this all the same. The construction is very very nice. I was impressed with how well made it felt while adjusting. I’d add 2 things and to be fair I am not a tripod guy either. The DayTrip is pretty small. I was questioning whether if it would really come in handy as it doesn’t extend much. I guess its fine for a landscape or some night photography, like you said, if you just need something to hold the camera still. And second, I didn’t find them so light. I thought they would be lighter judging from the size but when I picked the DayTrip up, I have to say it had some heft. The Road Trip by comparison felt (to me) almost the same weight as the little one which made it seem lighter because of its size. Maybe that is on purpose so its more stable? All in all however, I wouldn’t toss ’em out of bed for eating crackers! 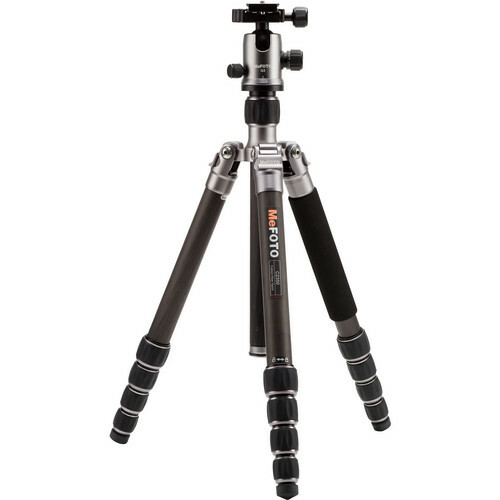 These look very similar to the Sirui T-005 tripods that are a bit less. It would be great to see a comparison review of the two brands.